Your Maui private custom charter awaits you… It’s your boat for as long as you like, so where would you like to go? 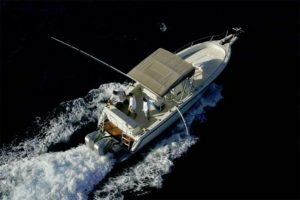 Aboard Xian, a 29 foot Stamas Tarpon, you get to choose everything! What time you’d like to depart, where you want to go and what you want to do. This thirty six foot luxury speedboat is equipped with everything you need to have an amazing experience. A personal captain is at your disposal. Visit the outer islands, go dolphin or whale watching, swim with the turtles or explore sea caves, the choice is yours. Fully equipped for sport fishing, snorkeling or just cruising in perfect privacy, Xian offers affordable rates and an experience you’ll cherish forever. Visit our Wailea Boating Company website for more information.